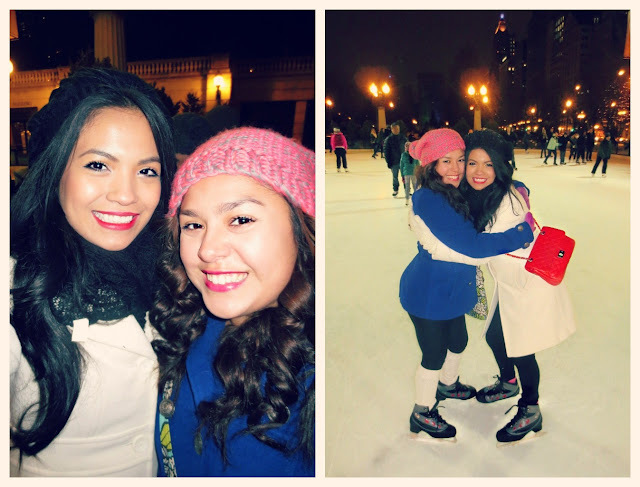 I think Ice Skating is on everyone's bucket list for the year. Through out the whole Winter season one of the main things I always wish for is a day of Ice Skating. 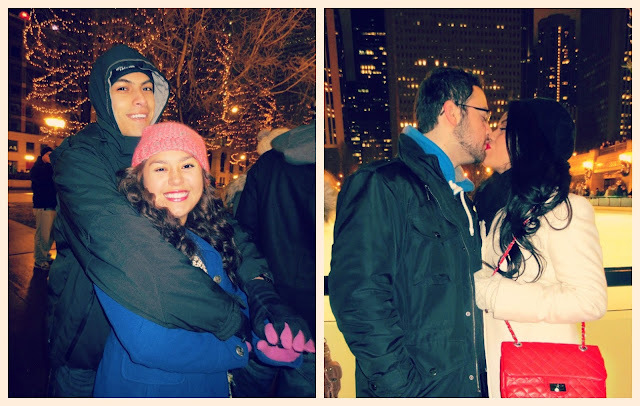 It's hard to find things to do in this freezing Chicago weather, but you can always count on the city's annual festivities and events. I have always been ice skating indoors during Chicago's Winter Wonder Fest, but I have never experienced it outdoors before. 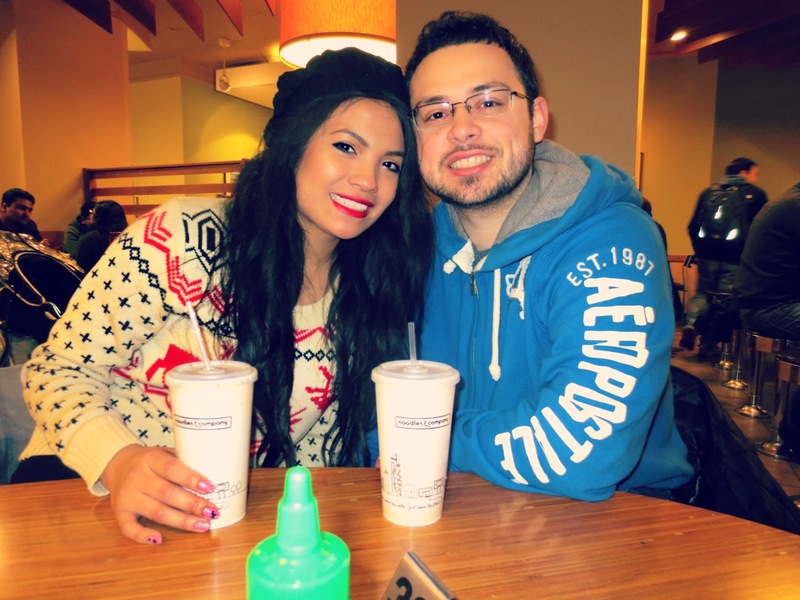 My girlfriend Alex and her hubby Leo invited us to go on fun date Downtown. It was a cold yet beautiful day surrounded by the luminous skyscrapers and decorations. I'm glad Alex held on to me most of the time, while the boys showed off their moves, I'm not quite the professional yet. Thank you Alex! Alex and Leo took us to one of their favorite places to grab a quick bite when they are in the city. We went to Noodles & Company. Ahhh the food was fantastic and the customer service was very nice too. I am a pasta lover! It reminded me of Panera Bread. Afterwards we all went to Ricardo's and watched Thor. I was exhausted from an exciting day and fell asleep on the warm comfortable couch and unfortunately didn't see the movie ha ha. Our next date, Alex and I, will be to watch Les Miserables in Theaters. Have you guys seen it? Did you love it? Time for me to go to sleep it's late! Ginger looks so cozy on the bed and I want to join in. 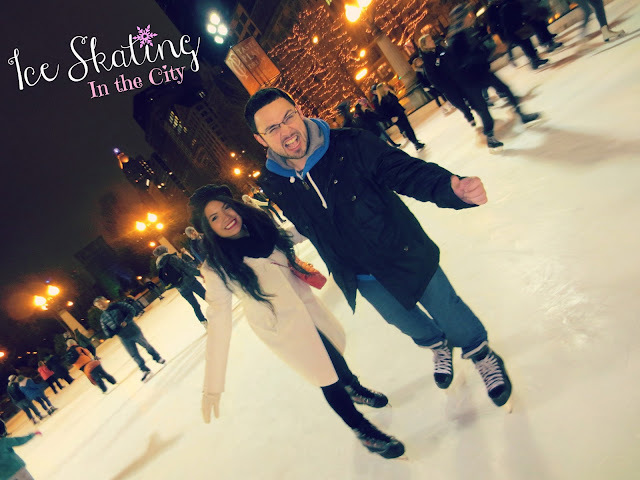 One more thing to cross of my bucket list, to ice skate with the love of my life, outside in the beautiful city of Chicago, in the snow. Good night loves! The boys were sweet enough to get us hot chocolate while we waited in line.